At Rosa Parks Elementary School in the Western Addition, the bike racks are filling up. Even with San Francisco’s hills and often far-flung school assignments, Dorie Apollonio thinks she and her family have helped start a trend at the school ever since they started dropping the kids off by bicycle from their home in Parnassus Heights. Pedaling two children a few miles across San Francisco need not be an exhausting effort, as more families are finding. Bikes with electric assist motors can replace the family minivan, as Apollonio and her husband did in 2012. Since her family went car-free, Apollonio brags that they are saving loads of money and never have to worry about traffic. “San Francisco is the kind of city that is made for assisted bikes. There are, famously, a lot of hills,” Apollonio wrote in a post from last September. She says she correctly predicted “that 2013 would be the year of the electric assist bicycle,” saying she’s noticed a boom in their use. “I, and everyone else riding one, can testify that an assisted bike will make driving in the city seem ridiculous,” she wrote. 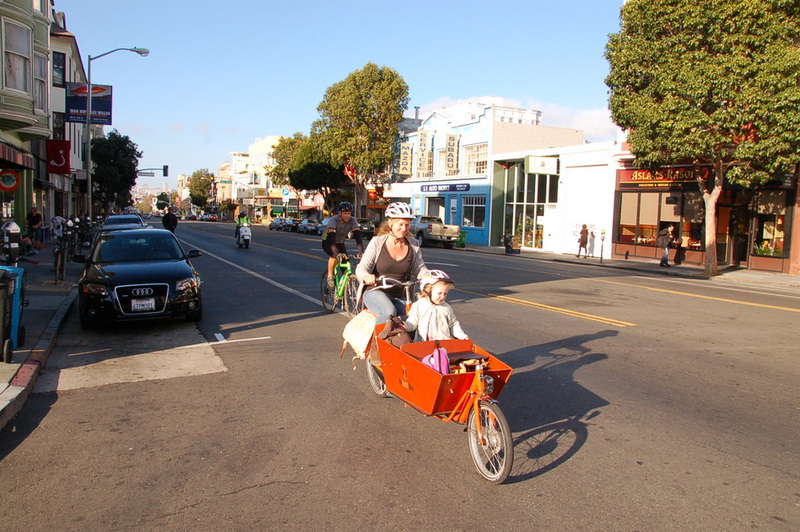 Families relying upon cargo and electric bikes seem more numerous this Bike and Roll to School Week than in previous years, as San Francisco starts to resemble cities like Amsterdam, Copenhagen, or Tokyo, where cargo bikes hauling children are just a normal part of the streetscape. To meet the rising demand, Kit Hodge is leaving her position this month as deputy director of the San Francisco Bicycle Coalition to start a company called Vie, which will lease out family-friendly bikes with features like cargo racks, electric assist motors, and passenger seats. “It really makes parenting a whole lot easier,” said Hodge, herself a mother who transports her kids by motorized and cargo bikes. She said that although such bikes are far cheaper than owning and maintaining a car, many San Franciscans are still hesitant to make a several-thousand dollar commitment up front, often to import a bike. She hopes to address that barrier by providing more flexible, “middle ground” ways to get bikes to families. “The idea is to allow folks to try different options, without an obligation to buy,” said Hodge. The bikes will be available for lease on a monthly or short-term basis. Hodge said the SFBC has seen the growing demand for such a service, with many parents asking questions at the SFBC’s family biking classes about the most practical types of bikes. “It became very clear that, for many people, the current interest was really touching bikes, seeing the options,” she said. As Apollonio has documented with her blog, adapting to car-free family life can pose challenges at first, and the family still sometimes uses rental cars and car-share. She says the family brushes off the occasional finger-wagging from those who assume biking with kids is dangerous. A year ago, Apollonio and her two kids were injured by a driver in Golden Gate Park. But it hasn’t kept the family away from bicycling: Apollonio wrote in a blog post that “what happened to me was terrifying and dramatic and depressing… but it was also anomalous.” She pointed out that studies consistently show that benefits outweigh any risk involved with bicycling, which are similar to driving. The streets only get safer as the city adds traffic calming and better bike lanes, and as more people on bikes create safety in numbers. On her commute, Hodge said she sees a lot of other families on bikes, particularly in areas with good bike infrastructure like the Panhandle. Each family serves as a sort of advertisement for a different way of getting around. “People are constantly talking to us and showing how interested they are,” said Hodge. 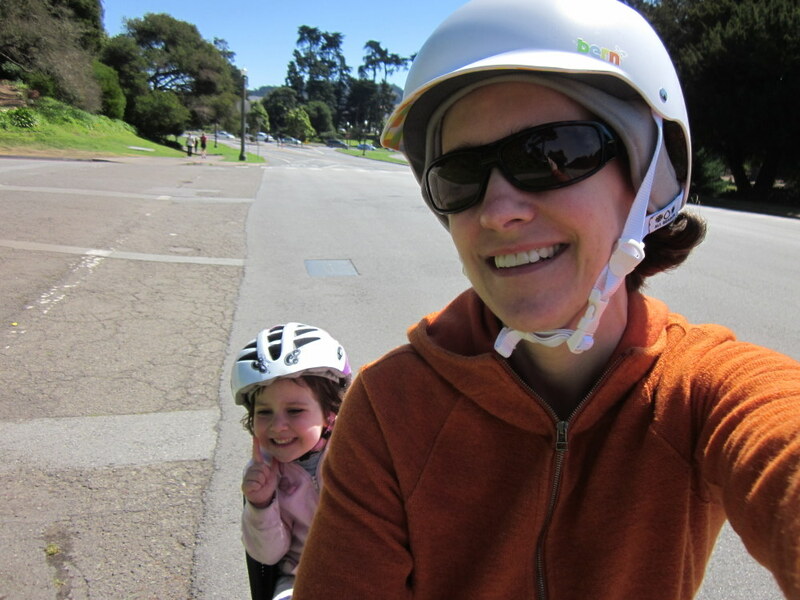 Apollonio and her daughter, riding on the JFK bike lanes in Golden Gate Park in a post last October. The thing holding me back from buying an electric assist bike is that they are so heavy. Some people may have ground level garages or storage space, but others have to contend with carrying their bikes up multiple stories to avoid theft and vandalism. Not sure there’s a good near-term solution for this. Hopefully, moving forward, building codes will require ground-level bike storage. There’s some very light weight e-bikes on the horizon that don’t sacrifice performance needed for SF hills. We’ve got some exciting products in the pipeline. Keep in touch with The New Wheel! I’m down in Palo Alto where it’s not so hilly, but I absolutely love my Bullitt cargo bike. I imported it from Denmark about 5 years ago, and then had Joel at Splendid Cycles up in Portland, OR create a custom box. My wife and I sold one of our cars to buy it, and it’s paid for itself multiple times over as I take both of the kids in it to school every day. I can’t recommend it enough. I have been carrying my kids on a cargo bike for over 5 years now. Electric assist is for wimps! j/k I am thinking about getting one, now that they are both in Starr King in the fall. 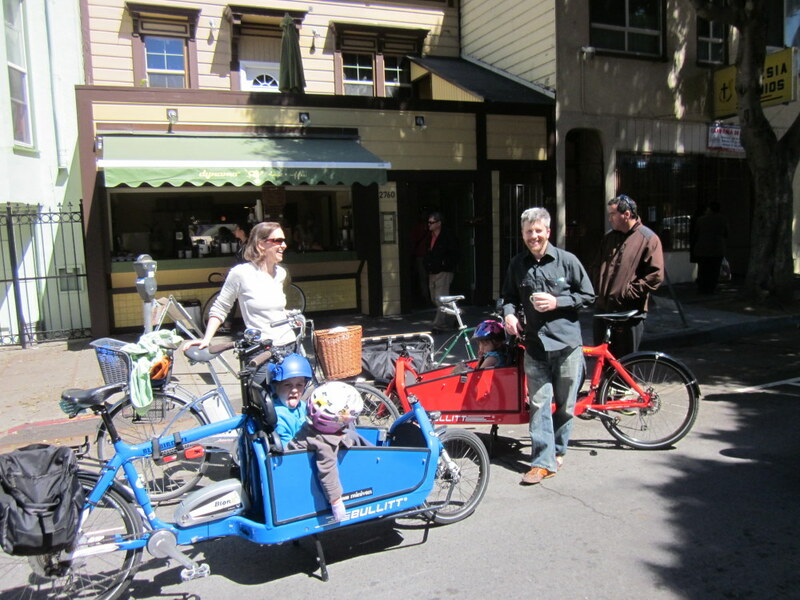 @NoeValleyJim – Starr King is a tough climb with a bakfiets full of kids. 😉 From the west, though, it’s a very nice uphill walk through the open space area (and faster than the squiggly Muni bus). Providing a lease program for family bikes reminds me of a saying attributed to Henry J. Kaiser: “Find a need and fill it.” The up front cost of buying what is (today, at least) considered a “niche market” bike can be daunting, especially when it approaches the cost of a low-end used car. A lease program allows parents the “test the water” before committing to cargo biking. Thanks to the work of SF Bike Coalition and their counterparts across the land, codes for new housing in SF and other cities now mandate a certain amount of ground-level bicycle parking space — and at least in SF larger-than-normal bikes have not been neglected. However, this does nothing for existing buildings, unless they are city-owned. See http://www.sf-planning.org/index.aspx?page=3470. There are solutions for long-term bicycle parking that can be installed in similar places as short-term bike corrals, but is there political will? Since they are even better car replacements, family bikes have the potential to exceed the fiscal, social and environmental benefits of single-person bikes, but only if all the pieces are in place: From leasing to parking. Great news. If some of you know of more places to charge ebikes and electric cars or would like to share your plug, please join the community on the Plugshare app! Perhaps nonprofit City CarShare will be renting cargo bikes along with their electric bikes, that would be cool. Does anyone use the bike sharing app where you can rent your own bicycle during the day? Bike seem to apply safety, but why is the bike so long that`s a program. 1) In my experience a LiFePO4 battery will last about 3 years and then you’ll need a new one. (Cost around $600?) The good news is battery technology is rapidly improving, and you’ll probably get a smaller, lighter battery to do the same job when you switch. 3) Most any cargo bike that can carry kids can carry other heavy bulky things–like groceries! Even though I no longer ride my daughter on my cargo bike and I mostly ride my nonelectric, regular bike these days, I still keep the electric cargo bike for my weekly grocery run (takes up to five bags + 12 rolls of toilet paper!) and for when I need to transport other large items. There are very few things I can’t transport on my electrified Xtracycle even up very steep hills. 4) It’s very helpful to have an electric bike guy/gal who can service your bike. Not every bike mechanic understands electricity. I’m very lucky that my daughter’s school has a secure place where I can park my enormous bike on school days, and it’s walking distance to BART. This is only really practical because 90% of the people drive their kids to the school. If everyone wanted to bicycle and leave a bike there, it would be a mess. I believe you. Schools need to have mandatory parking minimums for family bikes as a complement to restrictions on automotive pupil delivery! I know that some people also use a folding bike for that school to BART (etc.) leg of the journey. If theres already a few racks that are overfull and overflowing with bikes locked to other street furniture, a bike corral that (*gasp*) replaces a car parking space or two could really free things up. In The Netherlands often a share of the bike racks will be spaced to fit cargo bikes, or so ive read. If there’s a safe place to lock up downstairs, you can bring the battery up to the apartment to charge it. I’m fortunate to have space in the garage with nearby power outlets. Such great news and a smart choice for families. Cargo bikes in general are awesome, and the e-assist makes it that much more practical. I saw a guy yesterday with two kids on his e-XtraCycle going right up 17th Street in Cole Valley and I was totally impressed. That Starr King hill is a killer. My kid rode alongside me from Bernal starting when he was about 3rd grade. HE could get up the hill leaving me huffing behind. 90% of all our cargo ebike customers buy their ebikes on our 12 month no interest financing plan which can get prices down to around $375 per month for 12 months. A lease program sounds really interesting, but I wonder how it will compare with financing price-wise. What I’d love to see is a cargo bike sharing network, where you could rent a bike for a grocery run for a couple hours. Like the commenter below, I live in a small second-story walkup apartment, and while I’d love a cargo bike storing and carrying it would be impossible. 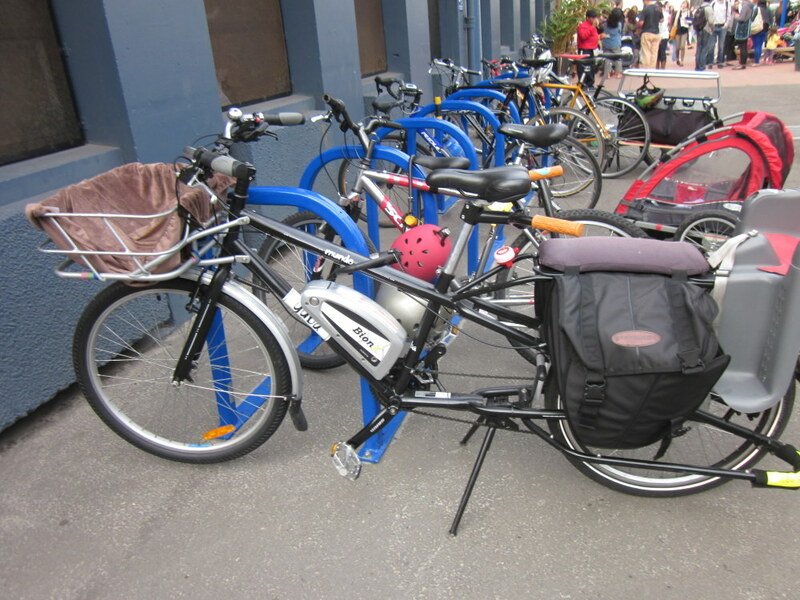 Organize it with a few neighbours – perhaps only one with kids that get ridden to school of course! – and pressure city to allow a collective-private locker for it… on the street?